I wanted to thank you all for reaching out to me and my family while going through this tough time with my mother. I wanted to give you all an update on what is going on. A lot of you know that I've experienced a lot of loss in my life. My mother is 69. Going on 55. She works full time and can hang like a 30 year old. My mother will be the only grandparent to our baby girl. She is a retired nurse and quite possibly one of the most intuitive people that I've ever known. She forgives easily but does not forget. She can figure out the recipe of a dish, just by tasting it. She will give you the shirt off her back. She plays a mean game of baggo and I think she secretly loves my husband more than me. In January my mom was told by her pullmonary doctor that he was 99% sure that she had lung cancer. He said that there is a 1% chance that it could not be, but he doubted it. She previously had pneumonia and went to her primary care for a chest xray and this is when they found a growth in her lung. She is mildly claustrophobic and was sent for a CATSCAN. The CATSCAN showed the growth in a much better light (whatever that means). My mom was ordered to then have a broncoscopy. This is a procedure when they go down your throat into your lungs with a brush wire and scrape cells. While your awake. These results came back "atypical". The doctor was not happy with the biopsy results and insisted that there was something there and sent her for a needle biopsy. I recently found out with in the last few years that my mother struggled with anxiety in her 20's and 30's. She had conquered it after that and had very brief episodes. This experience brought my mom right back to her 20's and 30's and she started having full blown panic attacks. I have struggled with anxiety for years and watching the strongest women in my life have to deal with this is heart wrenching. The needle biopsy is when they have you lay on your stomach and insert a needle between your ribs, through your back and aspirate tissue. While your awake. This biopsy too came back negative for ANY tumor cells. The doctor insisted on a PETSCAN. If you are not familiar with a PETSCAN, it shows where the "hotspots" are in your body. Cancer cells feed off of sugar and have a highly active metabolic rate that shows up on this type of scan. In other words, the doctor is looking all over her body for cancer. I don't think any of us slept well for a week. He tells her the best news in the world. Her PETSCAN is 100% clean. We now have 3 negative cancer cell tests. We had an appointment last week in Boston with a thoracic specialist to figure out what this is. Dr. Wee explained that it is a granuloma but not cancerous and usually stems from being exposed to some type of mold or fungus. Due to it's size he is going to remove it, instead of treating it with medication as it has already gotten a bit bigger. April 9th she is having the surgery and they will be removing the upper left lobe of her lung. Her lungs are functioning at 90% right now, and after the surgery she will be down to 76%. She will just need to recondition. My mother is that 1%. She is the statistic. Somebody has to be it. I truly believe that all of the positive thoughts and prayers from friends, family, social media including and especially the blog world has helped this miracle happen. Mom in her "healing" shawl that one of my coworkers gave her. 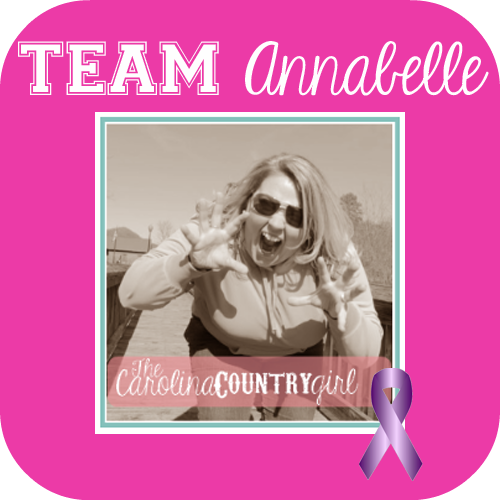 There is another sweet girl out there that needs all of that positive energy today and her name is AnnaBelle. She blogs over at The Carolina Country Girl. She recently shared her story on her blog about being diagnosed with Hodgkin s Lymphoma. Today is her day to get recognized and to be added to your prayer list. Lets give Anna all of the positive and supportive vibes that we can! Please go visit her blog and leave her some love. This is such amazing news! I am so incredibly glad that your mother is the 1%. You need your Mama and your baby girl needs her grandma. I just couldn't fathom a world where that was taken away from you right now. I'm just so happy to hear this! Such amazing news!! So happy for you both!! This is just a wonderful story about your mother. I'm so happy for you and for her!!! So so so so happy to hear all things!!!!! This is such amazing, happy news!!!!!! Holy crap - freaking amazing. Just wow. And can I just say - why do they have to do all those things while she's awake??? Ack. I know this is late in reading this but I got goosebumps and am so so happy your mama is good to go! Love you!